Consider a tale of two Escondido golf courses this week. Newly redesigned and rebuilt Boulder Oaks Golf Club was set to welcome back golfers with an official opening tournament scheduled for 9 a.m. on Saturday, May 14. The format is a 2-person scramble. The $40 entry per person includes a lunch buffet. 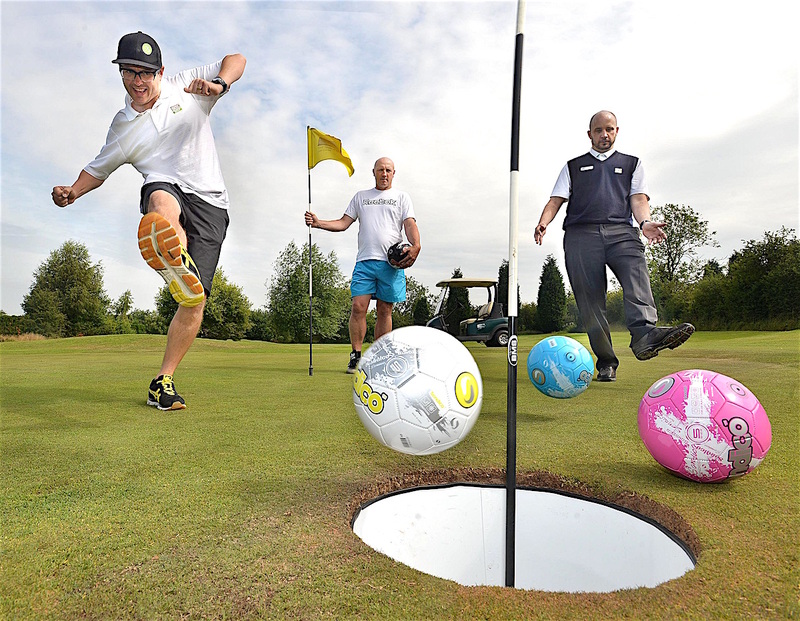 Meanwhile, Reidy Creek golf course cut the ribbon on something borrowed and something new in the world of sorta golf Saturday, May 7 with something called footgolf. Around 40 people attended the opening of footgolf where players kick soccer balls toward a specially made green and 21-inch hole. They do, however, use golf rules to play through. Where to begin with this. OK, footgolf is too much to ignore. Foot loose and fancy free, footgolf does away with golf clubs although it retains many of the accoutrements. All players need is a modified soccer ball and a desire to boot that ball on a pitch very much like a fairway toward a very large cup. Have no fear actual Reidy Creek golfers, the footgolf field is golf course adjacent to the first nine holes, but not at the actual for-golfers course. Whatever it is with local golf places and soft openings, this footgolf deal has been kicking about since March. A bunch of Escondido city leaders did the grand opening with ribbon cutting chamber of commerce thing on May 7. Footgolf uses golf rules. Footgolfers kick off, kick down field, or fairway or whatever, and finish it off at the 21-inch wide cup. Agnew said the new sport made sense considering the popularity of soccer in the region. In case you haven’t heard, San Diego County now features eight — count ‘em, eight — footgolferies including ones at Lawrence Welk Resort, Rancho Carlsbad, National City, Balboa Park, Tecolote Canyon, Mission Bay and Sun Valley in La Mesa. The American Footgolf League, governing body of the — shall we say — sport, calls footgolf a precision spectacle. People started playing the sport in 2001. The first tournament was held in 2008 at The Netherlands. The sport has taken root in the colonies, i.e. stateside, with nearly 500 courses in 48 states, the District of Columbia and Puerto Rico. More than 150 courses were added in 2015 alone, according to the AFGL. For those wanting to bend it in a way Arnold Palmer never imagined or Beckham,, and you know who you are, a nine-hole round of footgolf runs $12, while 18 holes costs $17. Those fees include official soccer ball rental, although players may bring their own. The course website is http://www.jcgolf.com. The AFGL is at http://www.footgolf.net. New, improved Boulder Oaks Golf Club. Actual golf, although not business as usual, “officially” debuted this week at the course formerly known as Meadow Lake Golf Club in the Hidden Meadows area of Escondido. The financially faulty course was closed from July 2105 to January as it underwent a $6.2 million redesign and redevelopment. 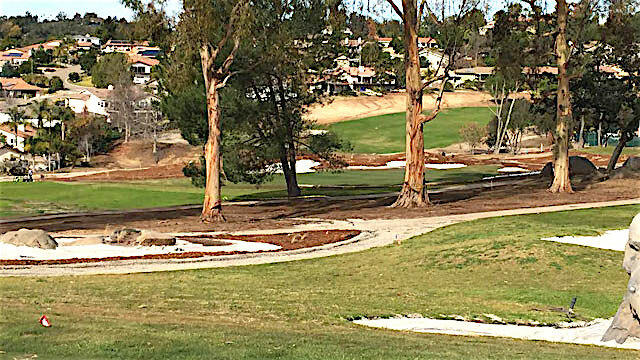 Local architect Dave Fleming did the honors whose transformation was made possible through funding from the Metropolitan Water District’s turf removal program. Three holes were added and three subtracted from the Meadow Lake equation that amounted to the newly renamed Boulder Oaks Golf Club.. Throw in for good measure native areas and shaved redwood bark replacing grass and stunning white bunkers and go bonkers golfers. Voila’, a new course entirely. People have been playing the course since February during an extended soft opening. It seems popular landscaping and design aside, due to tees being brought in considerable aiming to please the high handicap golfer. A smaller executive course hybrid of a championship course, the yardages as follows: blacks (5,726), blues (4,943), whites (4,377) and golds (3,774). Only one par-5 hole is more than 500 yards from black tees with 70 as par. Aside from water savings, the course was re-built to try to encourage more people to play golf, a sport which has seen precipitous declines in participating in recent year. To that end, Reidy Golf course this week went a number of degrees better. For those hankering to play golf like St. Andrews intended, Green fees — which include walking rates — range from $17 to $45 Monday-Friday, $27 to $55 Saturday-Sunday. The course website is boulderoaksgolfclub.com. Be the first to comment on "To golf or to footgolf: Is that a question?"